'View of Canton'. Aquatint, drawn and engraved by James Moffat, published Calcutta 1802.
bl.uk > Online Gallery Home	> Online exhibitions	> Asia, Pacific and Africa Collections	> 'View of Canton'. Aquatint, drawn and engraved by James Moffat, published Calcutta 1802. 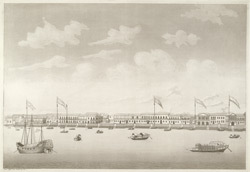 Aquatint by James Moffat from an original drawing of Canton (Guangzhou) in China, published in Calcutta in 1802. Canton was the first port in China to be opened to foreign trade and has a large population still living on river-boats.